Thread: What type of coffee cups do you use ? Just curious what sort/brand of coffee cups do you all use ? Does it make a difference to the taste of the coffee ? 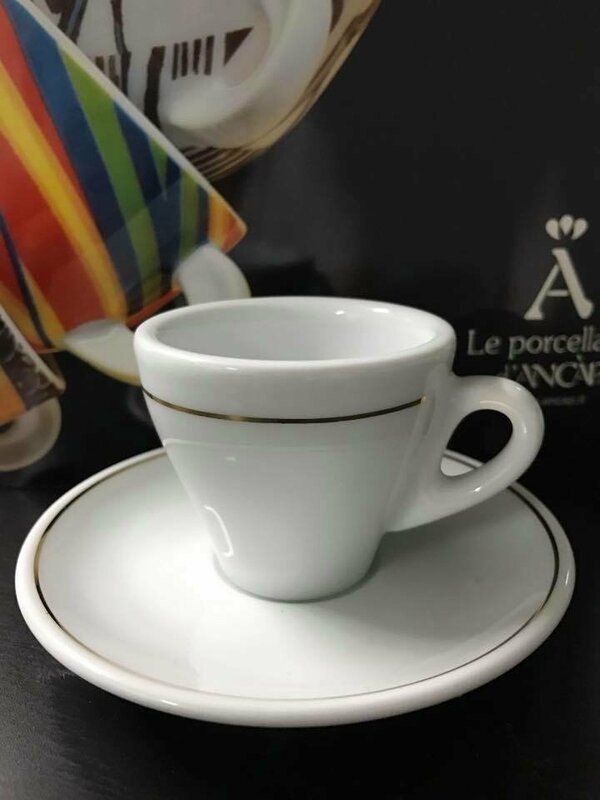 I have a set of ACF cappuccino cups as well as a set of espresso cups I bought in Italy. ACF are no longer made, however there are other makers I'm sure are just as good. Both made of heavy ceramic (keeps the coffee warmer while drinking.) they are nice to drink from, alter the taste? no, however the fact that your coffee remains warm whilst drinking certainly has an affect. Magic_Matt, MattyRay and Amandajayne like this. Yes the ACF cups were the industry standard for many years. Magic_Matt and Amandajayne like this. Interesting question. Some might argue that drinking from an attractive cup enhances the drinking experience. I own a pair of expensive Terra Keramiks but I don't find the coffee tastes better from them but you appreciate the quality of the cup while drinking from it. I mostly use a ACF 220ml, ACF 160mL, ACF 70mL and Duralex Picardi latte glass depending on what I feel like having. I agree that the chunky ACFs hold their heat better. I usually get a better cuppa from the 160mL ACF cup than the 220mL one but that's about coffee to milk ratio. Dimal and Amandajayne like this. I like using 250ml Bodum Pavina double walled/insulated glass cups. 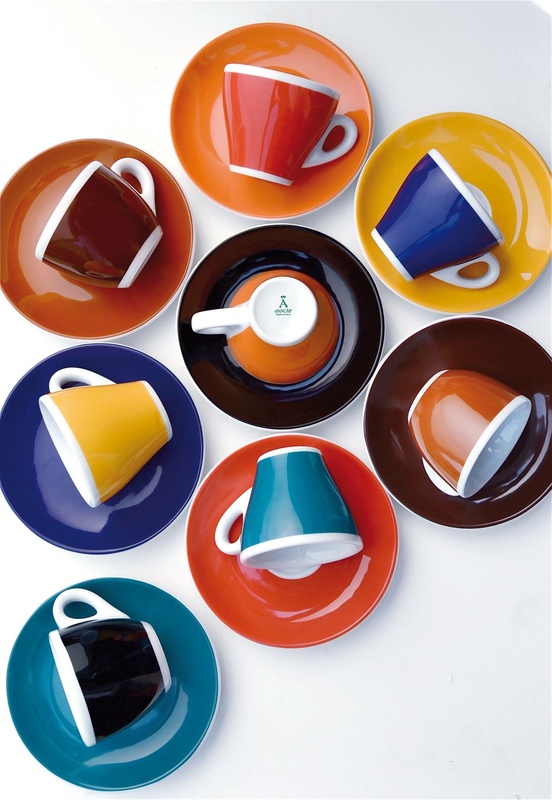 Lovely to hold and drink out of, but to be honest I have never used a standard espresso cup at home to compare them to. brettreaby and Amandajayne like this. What does ACF stand for ? I use twin walled borosilicate for all drinks. Works as well as most thermos flasks to keep hot drinks hot, cold ones cold. I use a lid if I need more than 20 minutes temperature stability. Over the last three years or so they have replaced all my conventional cups and glasses (including some AFC ceramics and some top grade crystal ware). They also happen to come in a variety of styles which saves domestics as to "who has which glass". I did a count, I have accumulated over 50 of them now (mostly 250ml in 6 different styles). Mine happen to be Avanti brand, however there are a number of other brands - just that a local shop handles Avanti and does half price deals every 6 months or so. Avanti come in a range of sizes from 80ml or 100ml "espresso shot" to 500ml "American only tubs". I normally use the 80mls for espresso, 100 or 150mls for afragatos and 250mls for lattes and iced coffees (and most herbal teas, fruit juices etc etc). Cold drip / steep coffee & lemongrass iced tea (and some thirsty visitors) get larger ones (350, 400, 450 or 500mls) in summer. Just avoid those twin walled "standard glass" - suitable for cold drinks only. Two friends of mine independently shattered theirs by pouring for a hot coffee into one. They are not an equivalent to borosilicate in any way. For the record, I have broken two of my Avantis without injury - both in a 1+ metre drop onto concrete (thanks to a "helpful" dog) which would have broken any ceramic or glass. So they are tough enough for a bit of mishandling. Being a glass variant, they do not taste of anything at all. They also have the advantage of displaying pours (or layered lattes when I feel the urge). I use Acme & Co., in league with the Nuova Point and ACF kind of cups, but subtly different in shape/volume and more to my taste. Bought them from Coffee Parts. Doesn't improve the taste over a glass, any of the random mugs I have at home, a double walled glass... just a good vessel. They heat up nicely, they retain heat fairly well but don't give me a false sense of security like the double walled ones do. I ALWAYS burn my mouth if I'm having a long black at my mates place in his double walled glasses, which is why I personally will never have them at my house. herzog and Magic_Matt like this. I use the same, reasonable to buy and hold the heat well. Also seem to impart no taste at all. I use ~210 mL Incasa porcelain cups as I find them perfect for long blacks. I believe they're like a cheaper ACF alternative. In regards to taste I don't think it makes a difference but it certainly makes drinking the coffee more enjoyable when you use a cup you like, even if it is all in the head! Dimal, shortblackman and cfeo like this. Casa Espresso and kbc like this. kbc, cfeo and Amandajayne like this. In addition to a preference for materials that preserve heat, I prefer cups that with a relatively small 'open end'. Not a big fan of cups with a large 'drinking circle'. Just a personal preference. Last edited by Barry O'Speedwagon; 10th April 2017 at 10:20 PM. 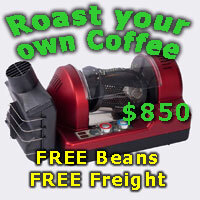 The Golden Bean ones were a special run we did as our sponsorship of the Golden Bean awards. I was particularly proud of how this years cups, pictured, turned out. 70ml Espresso, 150ml for Latte or Flat White. Don't like huge cups much. dan77 and Magic_Matt like this. I like your size choices. Its been interesting watching the move in cup sizes the last few years. 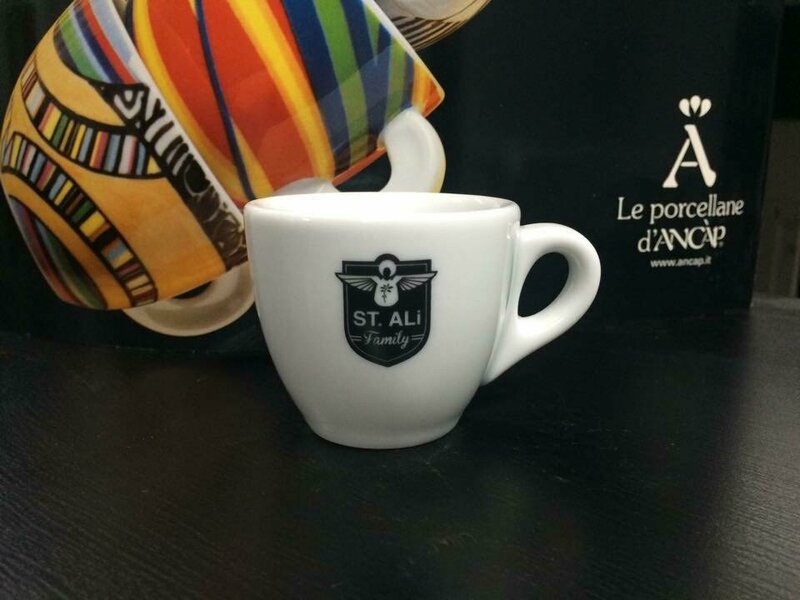 A few years ago our most popular size cup was a 180 to 200ml cup. Now it would be our 150ml "competition" spec cup. I think this is a combination of a flow through from seeing what competition barista use as well as getting a good milk/coffee ratio in the cup. Good thermal insulation. This really means porcelain, glass doesn't insulate. Its not just about thickness, it about the density of the porcelain. We have cut cups in half that appear very thick but the inner porcelain is almost like honey come. IMO thickness at the lip is not good design, look for a nice bevelled edge, gives a much better mouth feel. Look for an "egg shape" design at the bottom. This shape prevents the cream from dissipating as the shot flows into the cup. Should be "non porous", nothing worse then having to bleech your cups every 6 months. No idea. No doubt something Italian. Might be something to do with the name of the makers, FAC??? For espresso based drinks I have a set of 7 Oz ACFs courtesy of site sponsor Silipo Coffee, a nice quality ceramic cappuccino cup of unknown manufacture but reasonable quality branded Vittoria that I bought because it has a cool print, a couple of double-walled latte glasses, and as per a recent thread, a couple of IKEA glazed plant pots (also about 7Oz). For filter/aeropress/Trinity1 etc, I normally use one of my Sol reusables, a crystal whisky glass, a larger double-walled glass or one of a couple of trendy handleless cups - depending on my mood and whether I want to keep hot for slow savouring or let cool to drink sooner. Hey Antony, do you have a link so I can buy d'Ancap cups from you? Very noice selection, love the d'Ancap range Antony, wish I could justify a set. Casa Espresso and Listen4Life like this. When we exhaust supply if we have guests over, I give them double walled cups as a last resort. Those things mess with taste perception. Last edited by herzog; 11th April 2017 at 03:25 PM. We have accumulated a lot of cups over the years. Many are in storage or were given away. 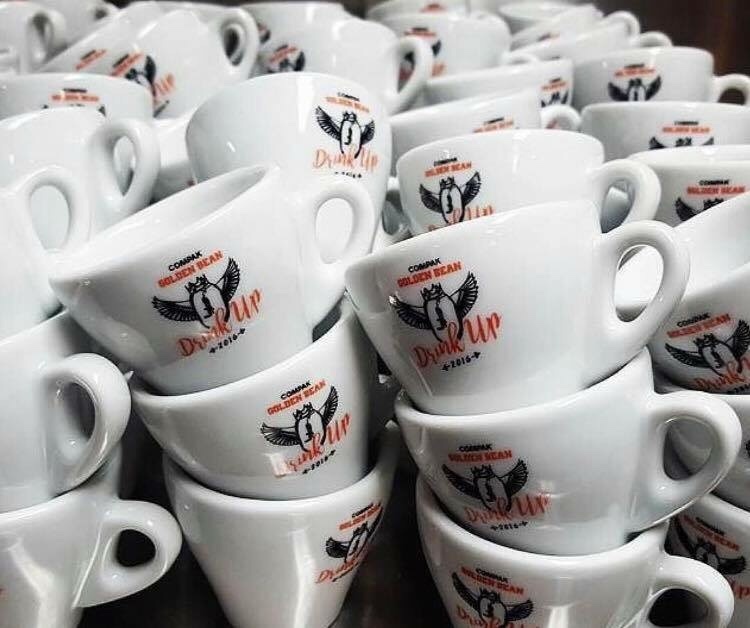 Our day to day cups are the no longer made ACF 270ml tulips. Originally 6 in black and 6 in red, but there was an 'incident' about a year ago when a visitor to the house managed to kill a few of them (knocked off the bench when turning around whilst wearing a backpack). We now have 5 black and 3 red (plus a white I picked up elsewhere). Also around 4 espresso sized no name porcelains. 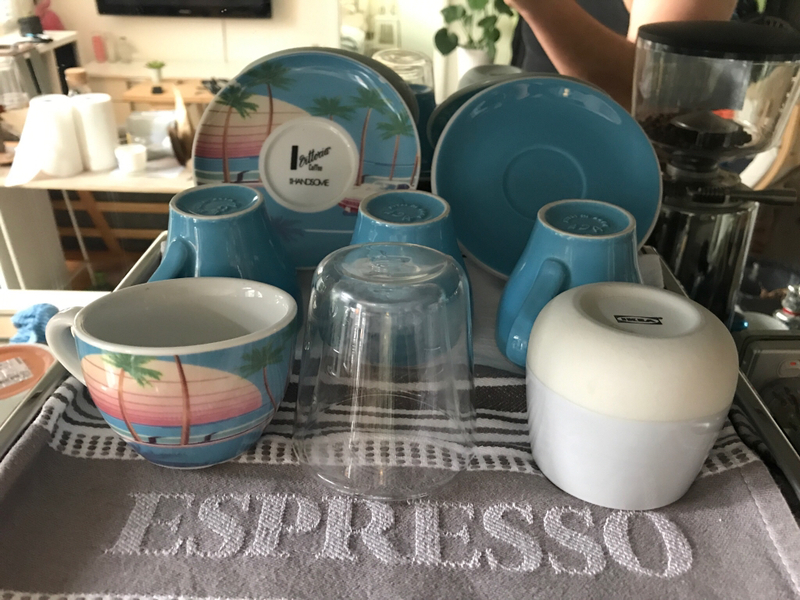 I bought 4 Nuova point espresso cups today for 80 cents from an op shop. Dropped them & smashed 2 before I left the shop. matth3wh and shortblackman like this. Well, they sure look good. The ones with scenery are amazing. I still have quite a few ACF's tho' they're in a box being oxymorons!! ..... original and best but I don't use them 'cos I can't replace them! My everyday glass for visitors having lattés is the Libby Endeavour Rocks 207ml (also comes in 250ml but is too big) handy as it has a 1oz moulding line around the base for measuring the shot. That is why I have such a range of styles - the borosilicate ones vary from almost vertical (my own preference) to well beyond shallow traditional teacup flares. Different strokes for different folks. Still it makes it a lot easier to identify whose cup is laying around when the rellies visit in "ravening horde mode". Sadly, I have a heap of cups & glasses which I no longer use - including a quite a few novelty ones. I just cannot bring myself to part with. "I'm already visualising this coffee on your head", "Complaints Department pick a number" (number attached to a hand grenade pin! ), "The art of conversation is, like, kinda dead and stuff", "My employer believes in a work - work balance" and a few of their friends. Perhaps I am just a cuppaholic or glassaholic? I have Premier Tazze (Ex Rockingham) cups as I liked the look and colours without being the most expensive, but I wasn't sure where to buy in shop so probably spent too much with freight. and they are on the way to you now!! A couple of years back I've actually started a little travel tradition. 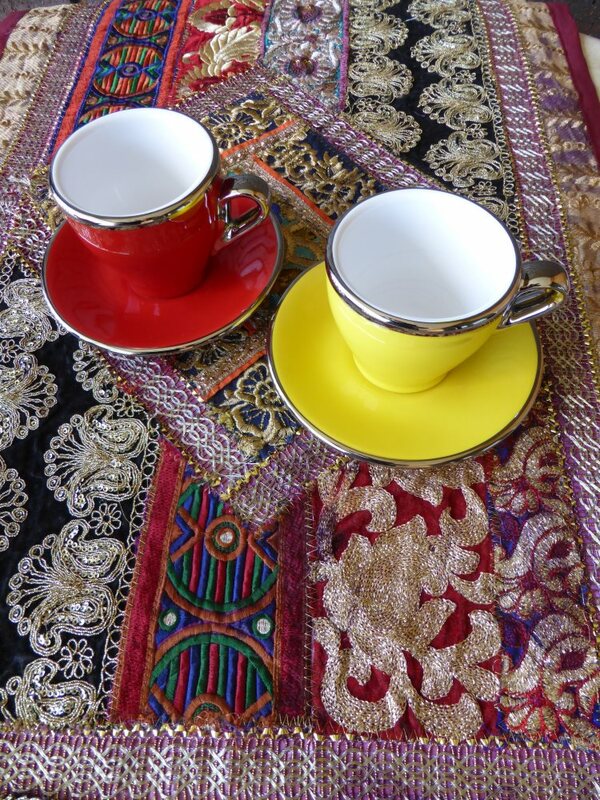 Each time I visit an overseas country, I try to bring back an espresso cup. Here's a sample: Austria, Ireland, Bermuda, Switzerland, and South Africa. Dimal, fatboy_1999, Magic_Matt and 3 others like this. Here's an indicative sample of my lineup as described above. I love that sunset cup. It was seven bucks from that weird cafe outside the Gallery of Australian Design on lake Burley Griffin!! I have just two of these (like Flynnus) which I love using. I would like the whole colour range but acquiring them was just too painful. If a reliable supplier existed I would buy more. Thanks Yelta. My Mum (102) who is used to fine Bone China for drinking tea, was blown away when she picked one up and found how thick and heavy it was! As a non-coffee drinker she had no idea why it was so heavy. I also come from a family of tea drinkers Rocky, know exactly what your talking about. Crikey 102, quite an innings, did she get the telegram/letter from the Queen? Wedgwood night and day cups. Nice and thin, IMO gives a better mouth feel. About 180ml capacity. I also have Japanese double walled titanium cups too. Yes Mate, the Queen, the Governor General, the Premier, the Local Member, the Mayor. Once you mention it to your local Member it is off and away. It is a nice process in this day and age that all of the Offices of State do this. She is pretty grounded so she wasn't over-awed by it all but it adds to the whole deal. Have just dropped her back to her unit at the retirement village after a day here with us. Andy, Dimal and level3ninja like this. Magic_Matt, matth3wh and charzy like this. Beautiful Flynn, tried to buy a set a few years back, it all got too hard.